Dorli Rainey, an 84 year-old retired school teacher was pepper-sprayed in Seattle's Westlake Park on Tuesday along with other protesters on the corner of 5th avenue and Pine Street. A mass of protesters had gather to show support for the Occupy Wall Street Protesters in New York. Police forced the crowd back and threw pepper spray into the crowd; a priest, and a pregnant woman were sprayed. Even Michael Bloomberg in a press conference today acknowledged that the protester's anger should be heeded. It is foolish to think the recent spate of protest movements that have sprung up in the United States in the last three months have been orchestrated only by young people, the unemployed, and the n'er-do-wells-of-society. The movement embodied by Occupy Wall Street in New York City, which has spread nation wide, has only gained in momentum, not only by the young, but also by older generations; by teachers, the supporters of youth; by mothers; priests. People we look up to as well as people who care about society in general. Activism is supposed to be about doing something to promote change. 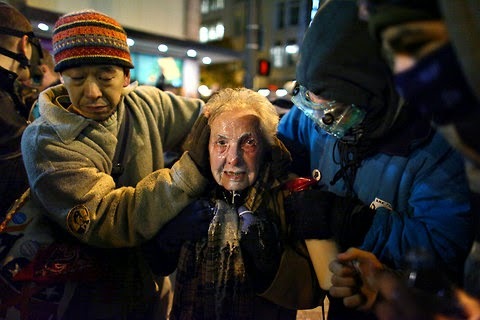 When an 84-year old retired school teacher in Seattle was pepper-sprayed on Tuesday on her way to show support for ousted protesters in New York, I felt anger towards all the people who have said that this movement is irrational, unorganized, fake, not able to gain momentum, should stop, protesters should go to work, and so on.